Do you have a clear evening sky – unobstructed by trees, tall buildings, or any sort of haze? 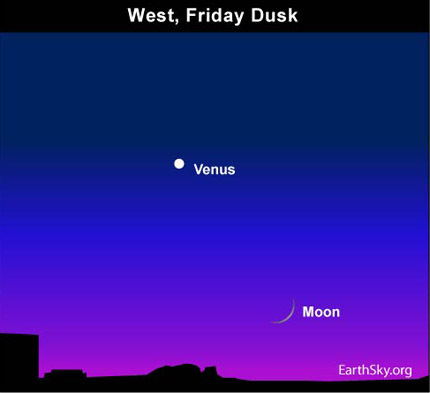 Then look near the western horizon, shortly after sunset Friday evening, May 14, for a very young waxing crescent moon. If you cannot see the whisker-thin lunar crescent with your eye at first, try scanning with binoculars along the western horizon, in the darkening twilight. Then, once you spot the moon, set the binoculars aside, and gaze at it with the eye alone. Or, do it the other way around. If you spot the moon with your eye, use your binoculars to gaze at it more fully. Don’t tarry when looking for the moon, for it sets about one hour after sunset. The moon was new, or more or less between the Earth and sun, yesterday. Tonight’s moon has barely pulled away from the Earth/sun line, and its lighted half is still facing almost entirely away from us. As the line of sunset moves westward across Earth’s surface tonight, the moon will be inching slowly away from our line-of-sight to the sun. Thus, from the west coast of the U.S. this evening, the moon will be a somewhat fatter crescent, somewhat easier to see in a very clear western twilight sky. I often hear from people who wonder if . . . when the moon is a crescent . . . part of the moon is dark because Earth’s shadow is falling on it. It is true that Earth’s shadow extends as far as the moon in space. Earth’s shadow does sometimes fall on the moon, and when that happens, we see a lunar eclipse. However, that can only happen at full moon, when the Earth lies in between the sun and moon. You are seeing a shadow on the moon tonight – but it is the moon’s own shadow. All worlds near our sun have a “day” side and a “night” side, just as Earth does. 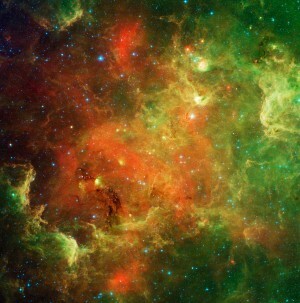 Earthly “night” happens when we move into the shadow of our own planet. The moon appears as a crescent tonight because we can now see only a portion of its lighted “day” half. If you could fly to the moon, and go around to the backside of it, you would find a nearly full face of the moon shining brightly. Therefore, the darkened part of the moon this evening is not an eclipse. It is the moon’s own shadow. Why does the shadowed side of the moon glow dimly, as though illuminated by a fainter light? It is because, when we see the moon as a crescent, any beings on the moon would see a nearly full Earth in their sky. If you miss the moon tonight, try your luck tomorrow night.